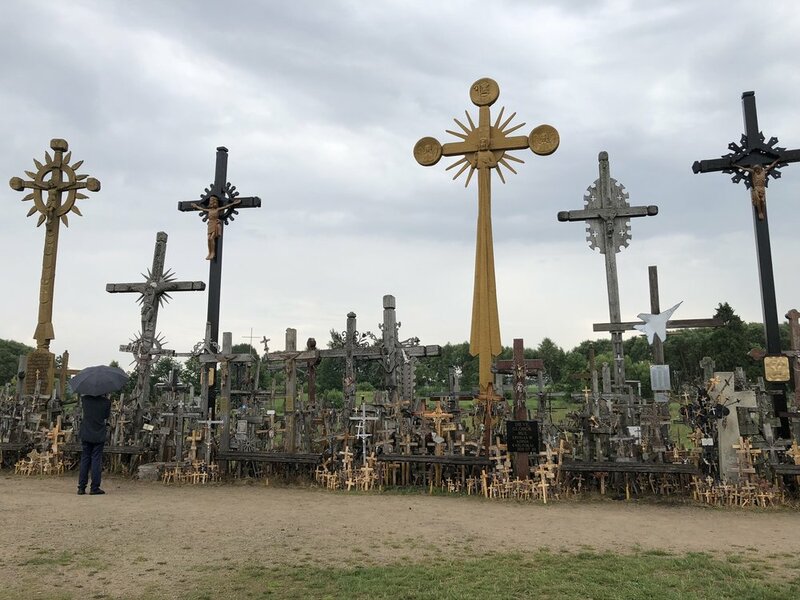 ŠIAULIAI, LITHUANIA – Driving through the lush, green countryside of northern Lithuania our European hatchback turns off the highway to visit one of the oddest spiritual wonders of the Baltic world: the Hill of Crosses. Looking up as you enter the Hill of Crosses in Lithuania. Lithuania “is a Catholic country sandwiched between Orthodox Russia and Lutheran Latvia and, for many centuries, Eastern, also largely Lutheran, Germany. 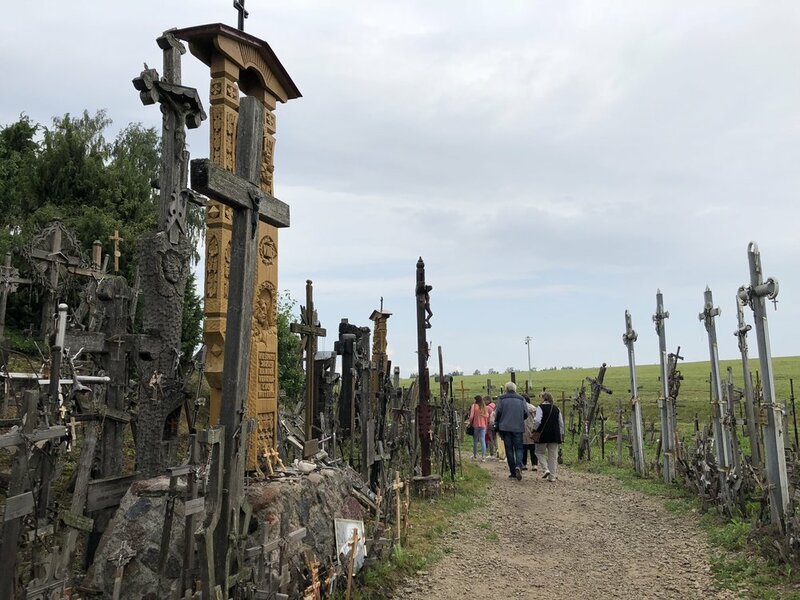 On the way to Vilnius, the capital, out in a field far from any town, there is a hill of crosses with origins stretching back over several centuries. Clearly, these crosses were a tangible way for often beleaguered Catholics to bear witness to their faith. Under 18th and 19th Century Russification, the Orthodox Russians would take the crosses down and the Lithuanians would put them back up. Then came World War I when the Germans took them down and the Lithuanians put them back up. Then 20 years of independence gave everyone a rest until the Nazis came, followed by the Soviets, and the process continued. Finally, the Soviets just gave up. The Lithuanians were too persistent. Since the Berlin wall came down, the country is independent and the crosses arise without threat. 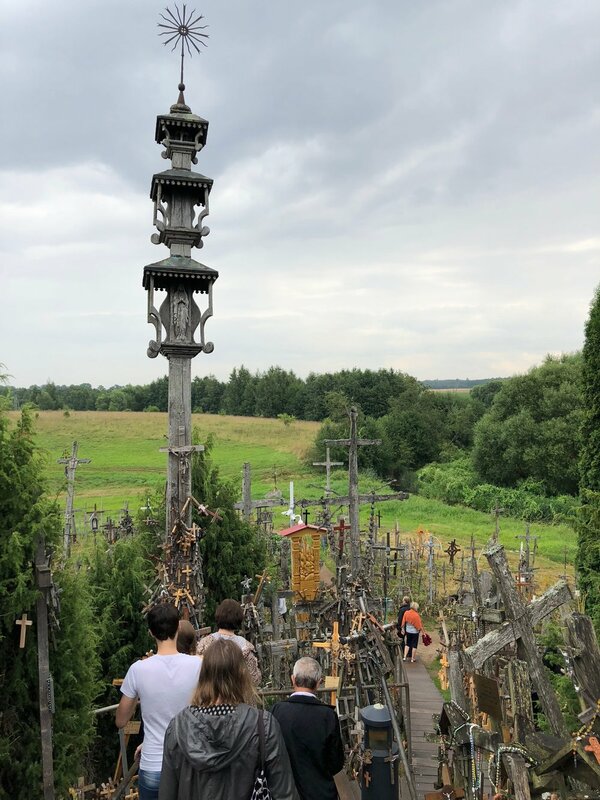 Pope John Paul II put one there as did the Armenians in 2001 on the 1700th Anniversary of their country becoming Christian in 301 A.D.
A view of the Hill of Crosses in Lithuania. Roberta had also given her speech on beauty at LCC International University in Klaipeda on Lithuania’s west coast, right on the Baltic Sea, in recent years. That inspired connections and visits between The King’s College and LCC International University, including my visit to Lithuania last Summer. Marlene Wall, the president of LCC International University, had also recommended this roadside wonder as a must see. And she couldn’t resist joining for a road trip to the Hill of Crosses, a place she visits regularly. In the car ride, she spoke with LCC communications professor Dr. Andrew Jones, his wife Charity Jones and me about why people flock to the site not just once but multiple times. Arriving at the site, I felt like we were on set in a Tim Burton movie, as crosses start showing up in eccentric dimensions, seemingly multiplying before your eyes. 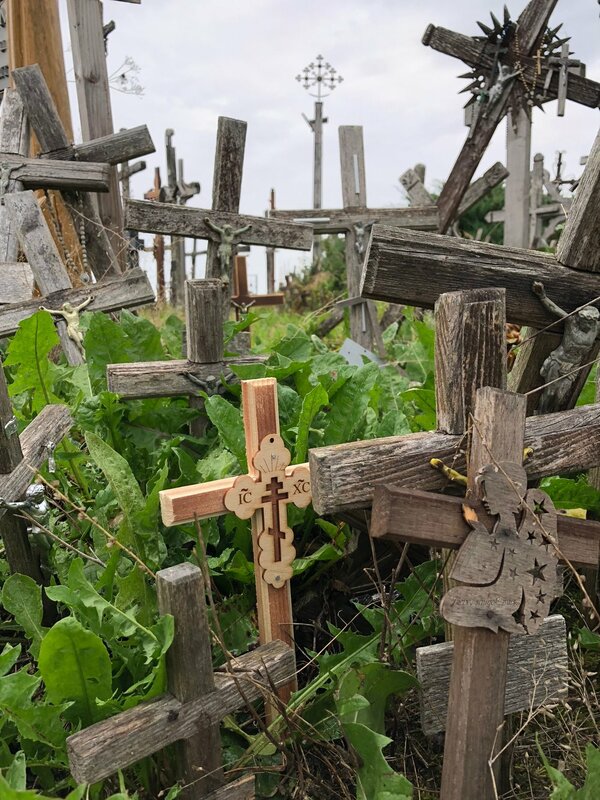 First, you can buy wooden crosses of many varieties and many price points They each have a spike at the bottom so you can plant your own cross in the ground amid millions of others. Crosses for sale to plant at the Hill of Crosses in Lithuania. As you walk a long, bricked and gravel pathway to the hill, you start to notice odd and sundry versions of the cross and crucifix emerging from the strange mound. High crosses. Low crosses. Gold crosses. Black crosses. Silver crosses. Some forged from metal. Others carved from wood. Some are covered with rosary beads or smaller crosses. Some crosses bear the forlorn face of Jesus, the Christ, mournful and soulful on the cross. His eyes look down from many angles as we traversed the rickety steps and winding pathways for a few hours in a misty rain with other pilgrims from every corner of the earth. The walk toward the Hill of Crosses. In other parts of the hill, large statues 15-feet tall showcase Jesus holding his arms skyward, to his father in Heaven, giving us hope. Another carved statue shows Jesus wearing his crown of thorns and surrounded by dozens of small crosses. One metal cross has a message of provenance: “Erected by Baltic Air Policing Hungarian Detachment (Block 39)” on Nov. 1, 2015. OK? Thank you. The mix of weathered crosses and newly-planted crosses, the sorrowful and hopeful eyes from Jesus all around starts to inflict a strange feeling. You feel sad. You feel moved. You feel burdened. You think about the passing of time. You think about all the people who have planted crosses on this site. The challenge of photographing and Instagramming from within the Hill of Crosses involves isolating key images from unusual angles and in a way that doesn’t become redundant to the other images you are seeing and shooting. Also, so many crosses are sticking in and out of every single frame, you have to be creative at isolating worthwhile images. Marlene Wall is an enthusiastic and prolific Instagrammer. We found ourselves sharing photo tips and techniques while traversing the hill. At one point, I found a patch of weathered old crosses and weeds and decided that was where I wanted to plant my newly-purchased cross. To me, planting my cross in that forgotten part of the hill was my testament to being a person of faith and trying to humbly live that faith among new generations of people in places where faith may not be as abundant as it once was. 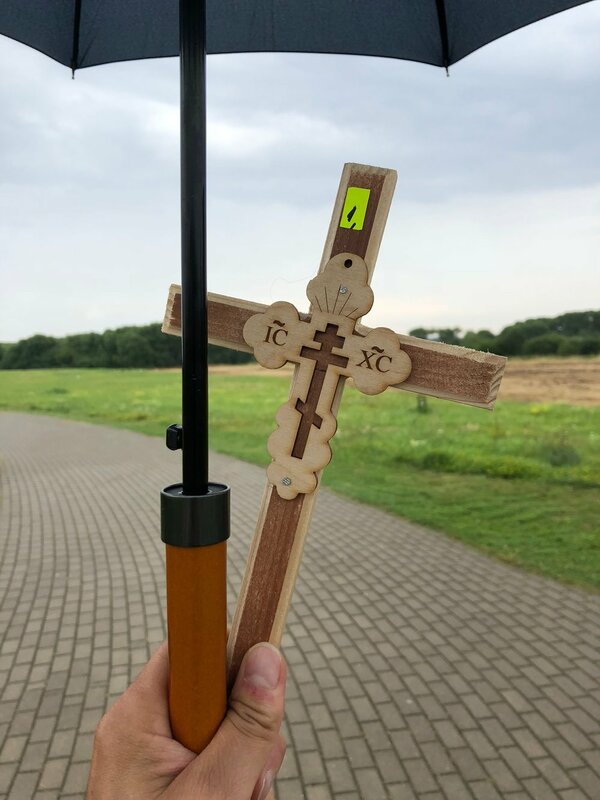 Every once in a while, after you think you have seen every type of cross at the Hill of Crosses, a new artifact strikes you. In one case, you might see an incredibly ornate, brilliant, massive carving and wonder, “How did some Lithuanian do that?” And the next moment, you turn a corner and see a simple cross made from two birch branches that is striking in its minimalism. 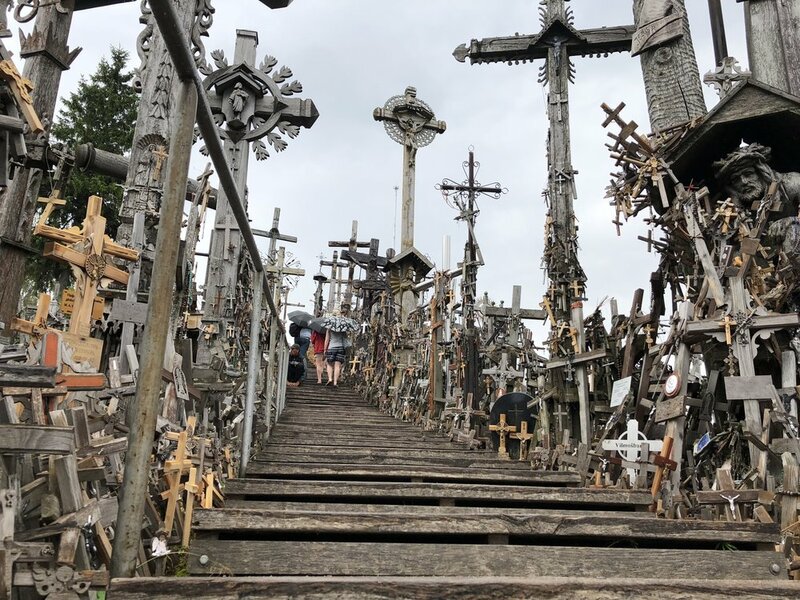 The exact origins of Lithuania's Kryžių Kalnas, or the Hill of Crosses, remain a mystery. 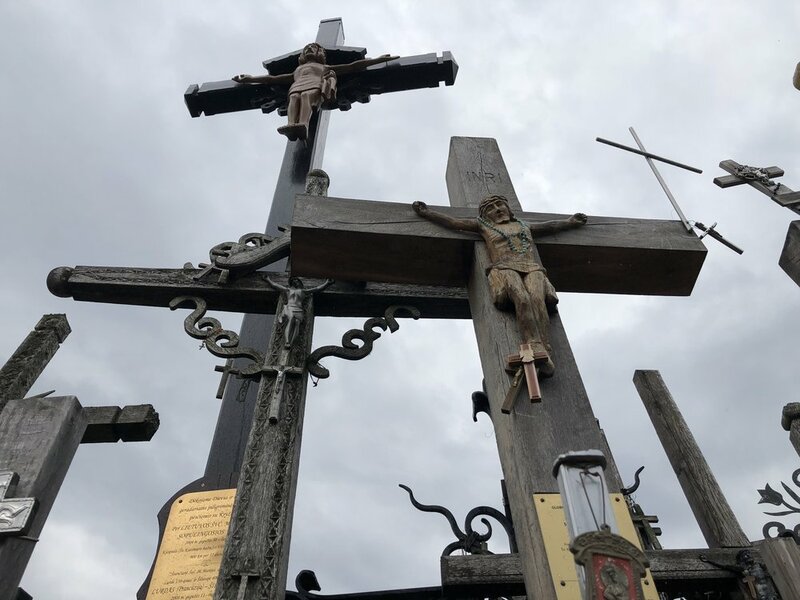 Just outside the northern city of Šiauliai, thousands of metal and wooden crosses—placed here for nearly two centuries—have found a home on the growing mound of religious fervor. Dangling rosaries chime in the blowing wind and provide a rolling soundtrack for icons of saints and photographs of revered local patriots. Despite many attempts to destroy it, this unusual pilgrimage site endures as a powerful testament to devotion. National Geographic noted that the origins of the Hill of Crosses are bandied about in legends and fables starting in 1850 or earlier. It reported that Russian tsars tried to suppress religious expression in Lithuania, forbidding families from burying their dead. Some legends hold that an avatar of the Virgin Mary appeared to Catholic believers, asking them to plant crosses all over the hill. On our road trip, Charity piped up that the site “was originally a graveyard for Lithuanian soldiers and the Soviets destroyed it...that was part of the reason why the grave was torn down. And the Soviets tore down a lot of graveyards in Lithuania anyway, and put their own stuff there.” She said the Hill of Crosses emerged seemingly overnight. And anytime the Soviets or others tore it down, Lithuanians would quickly rebuild the shrine to faith. However the site came to be, National Geographic cited cross-making as part of Lithuania’s cultural heritage as recognized by UNESCO. 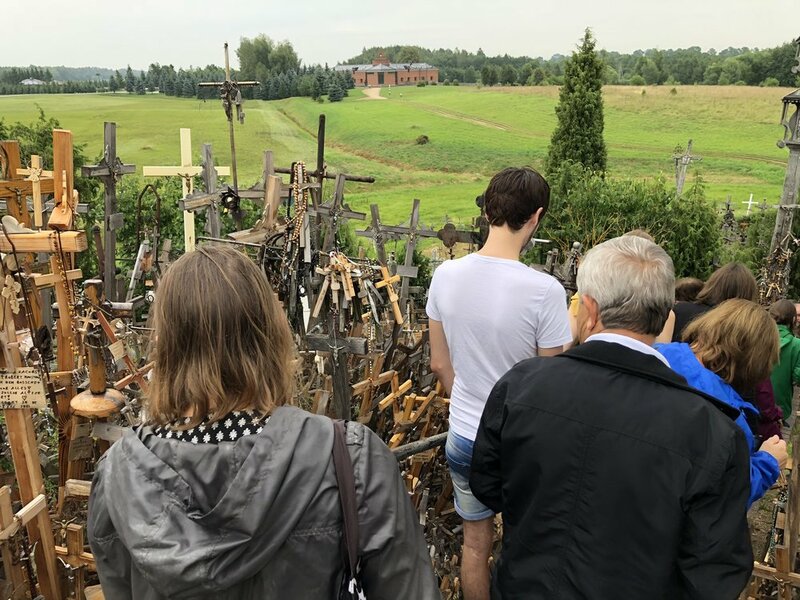 The fact the Lithuanian Catholics kept rebuilding the Hill of Crosses multiple times, under the cover of darkness, after it was bulldozed by Soviets and others deepens the site’s importance as a symbol of both national and religious identity. The site is maintained by a mix of volunteers as no one organization or individuals has sole jurisdiction over the site. In a historically Catholic country, I asked Wall what it was like leading a school that is historically protestant and welcomes students from all faiths or no faith? The Hill of Crosses is a similar place, a beacon of belief that welcomes crosses from many faith traditions, pilgrims of all types and serves as a unique wonder to the resilience of faith over time. Paul Glader is executive director of Religion Unplugged and an associate professor of journalism at The King’s College in NYC. He is on twitter @PaulGlader.